12 Things You Need to Know About Neonode Inc.
Neonode Inc. (“Neonode” or “the Company”) provides infrared multi-sensing interface solutions that make handheld, consumer, and industrial electronic devices touch sensitive. Neonode operates via a technology licensing model where revenues are primarily generated through non-exclusive, royalty-based licenses to original equipment manufacturers (OEMs), original design manufacturers (ODMs), and component suppliers. The Company’s innovative multi-sensing touch technology is branded zForce®, for which it holds multiple patents worldwide. Based on zForce®, Neonode has developed a variety of features that sense any object—its size, its pressure on a surface, its depth, its velocity, and even its proximity to the surface. This feature set is called Neonode MultiSensing™ touch technology. With MultiSensing™ technology, Neonode seeks to rival standard capacitive touch solutions. To date, MultiSensing™ has been employed in a Kindle Touch eReader from Amazon.com, Inc., the Nook eReader from Barnes & Noble, Inc., eReaders from Sony Corp. and Kobo Inc., and in the MEEP! tablet from Oregon Scientific Inc. The Company also has license agreements with Alpine Electronics, Inc., Netronix, Inc., BYD, and One Laptop Per Child, among other companies in the tablet PC, mobile phone, office equipment, and automotive sectors. Neonode has headquarters in Sweden with offices in California, Japan, and Korea. 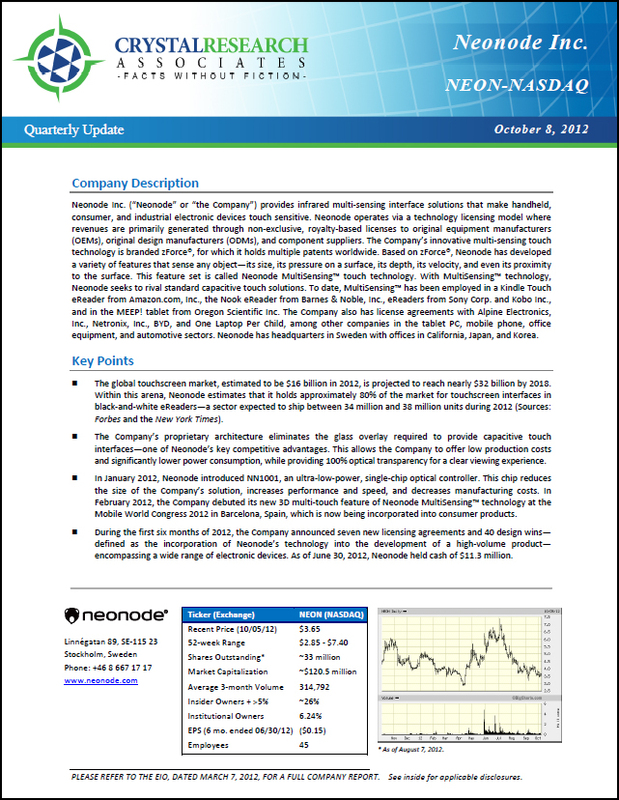 * The Corporate Snapshot was last updated on October 8, 2012.